This auction was won by s***c.
Enjoy a 4 night stay for 2 guests in a Superior Room at the five star Bab Al Qasr Hotel & Residencies, Abu Dhabi, UAE. Stay includes: daily buffet breakfast at the Artisan Kitchen and is valued at approximately $1,250 USD / £945 GBP*. Please note all additional purchases including meals, drinks, spa treatments, excursions etc. must be paid for by the winner separately. Auction Stay Dates: to be booked in advance and taken between 01 October 2018 and 31 March 2019, excluding stays between 11-15 November, 22-25 November, 24-26 December, 31 December – 01 January and over public holidays and celebrations, subject to availability. 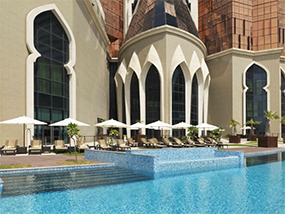 The five star Bab Al Qasr Hotel & Residencies is a very modern and luxurious hotel on the Abu Dhabi Corniche. This luxury hotel is a place of adventure, indulgence and time honoured Arabian Hospitality, with iconic architecture and an exclusive address. The hotel features luxurious guest rooms, suites and residences with premium comfort and amenities, all set on one of capital’s largest private beaches. There’s a sumptuous Spa, multiple restaurants and cafes offering everything from exquisite, signature dining to authentic Arabic coffee, plus a stunning ballroom, business centre, meeting and events facilities, limousine service, valet parking, pool and fitness centre. The winner and their guest will be staying in a 41 – 43sqm. Superior Room, designed in a contemporary style with influences of Arabian and Moroccan spirit. The room will feature a King, Queen or Twin beds, floor to ceiling windows with breath taking views of the city’s landmarks and a large marble bathroom with separate walk in rain shower and tub. Room amenities include: bottled water, tea and coffee facilities, toiletries, safe, minibar and complimentary wifi. Luxury Travel Diary terms and conditions apply. *This auction item is valued at approximately $1,250 USD by Bab Al Qasr Hotel & Residencies, Abu Dhabi, UAE – please note this valuation is the list price provided to Luxury Travel Diary by the Auction Prize Provider and should be used as a guide only as cheaper discounted rates may be available. No cash alternative is available. Auction item can not be used in conjunction with any other promotions or discounts. This auction item excludes flights and transport – you will need to arrange your own flights / transportation to and from your home to Bab Al Qasr Hotel & Residencies, Abu Dhabi, UAE to coincide with your booking. Your stay is subject to availability, must be booked in advance and taken between 01 October 2018 and 31 March 2019, excluding stays between 11-15 November, 22-25 November, 24-26 December, 31 December – 01 January and over public holidays and celebrations. Please note any associated taxes / resort fees / entrance fees etc. and additional purchases will be collected from the winner by the relevant property at the time of booking your stay or on departure and will not be deducted from the amount bid for the item. Original voucher must be presented upon check-in. Winners must pay for their auction item in full via PayPal within 48 hours of the auction end, otherwise Luxury Travel Diary Ltd. reserves the right to offer the auction item to the next highest bidder with immediate effect. To the fullest extent permitted by law, Luxury Travel Diary will not be liable for any loss or damage arising out of the winners’ use or enjoyment of the prize; and the winner acknowledges that Luxury Travel Diary accepts no responsibility whether directly or indirectly for any claims whatsoever arising in respect of the prizes provided by third party providers or sponsors.